Author(s): Karly C. Sourris, Glycation, Nutrition and Metabolism Group, Diabetic Complications Domain, Baker IDI Heart and Diabetes Institute, Melbourne, Australia, 3004. Henry Yao, George Jerums, Mark E.Cooper, Elif I. Ekinci, Melinda T. Coughlan. Diabetic nephropathy is the major cause of end-stage renal disease in Western societies. To date, interruption of the Renin-Angiotensin System is the most effective intervention for diabetic nephropathy, however these agents only slow progression of the disease. Thus, there is a major unmet need for new therapeutic targets. Aberrant activation of the receptor for advanced glycation end products (RAGE) is involved in the pathogenesis of diabetic nephropathy via binding to a variety of ligands and inciting reactive oxygen species (ROS) production, inflammation and fibrosis. In recent years there have been considerable efforts in the development of effective RAGE antagonists, however, direct RAGE targeting may be problematic. Glucagon like peptide-1 (GLP-1) is an incretin hormone released by the L-cells of the small intestine to mediate glucose-dependent insulin release from pancreatic islets. The incretin-based therapies, GLP-1 receptor agonists and dipeptidylpeptidase-4 (DPP4) inhibitors, are novel glucose-lowering agents used in type 2 diabetes. However, the extra pancreatic functions of GLP-1 have gained attention, including putative anti-apoptotic and anti-inflammatory properties. In rodent models of diabetes, incretin-based therapies are renoprotective. Interestingly, GLP-1 has been shown to interfere with the signalling and expression of RAGE. The current review aims to give an overview of the interactions between the RAGE and incretin pathways and to discuss the utility of targeting the GLP-1/incretin pathway in DN. It is possible that indirect targeting of RAGE through GLP-1 agonism will be of clinical benefit to patients with diabetic nephropathy. Keywords: Diabetic nephropathy, dipeptidylpeptidase-4 (DPP4), glucagon like peptide-1, incretin, kidney, receptor for advanced glycation end products. Title:Can Targeting the Incretin Pathway Dampen RAGE-Mediated Events in Diabetic Nephropathy? Affiliation:Glycation, Nutrition and Metabolism Group, Diabetic Complications Domain, Baker IDI Heart and Diabetes Institute, Melbourne, Australia, 3004. Keywords:Diabetic nephropathy, dipeptidylpeptidase-4 (DPP4), glucagon like peptide-1, incretin, kidney, receptor for advanced glycation end products. Abstract:Diabetic nephropathy is the major cause of end-stage renal disease in Western societies. To date, interruption of the Renin-Angiotensin System is the most effective intervention for diabetic nephropathy, however these agents only slow progression of the disease. Thus, there is a major unmet need for new therapeutic targets. Aberrant activation of the receptor for advanced glycation end products (RAGE) is involved in the pathogenesis of diabetic nephropathy via binding to a variety of ligands and inciting reactive oxygen species (ROS) production, inflammation and fibrosis. In recent years there have been considerable efforts in the development of effective RAGE antagonists, however, direct RAGE targeting may be problematic. Glucagon like peptide-1 (GLP-1) is an incretin hormone released by the L-cells of the small intestine to mediate glucose-dependent insulin release from pancreatic islets. The incretin-based therapies, GLP-1 receptor agonists and dipeptidylpeptidase-4 (DPP4) inhibitors, are novel glucose-lowering agents used in type 2 diabetes. However, the extra pancreatic functions of GLP-1 have gained attention, including putative anti-apoptotic and anti-inflammatory properties. In rodent models of diabetes, incretin-based therapies are renoprotective. Interestingly, GLP-1 has been shown to interfere with the signalling and expression of RAGE. The current review aims to give an overview of the interactions between the RAGE and incretin pathways and to discuss the utility of targeting the GLP-1/incretin pathway in DN. 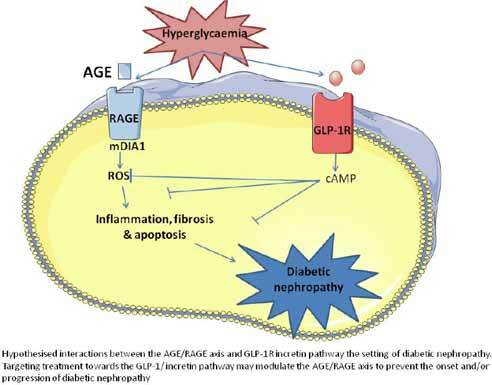 It is possible that indirect targeting of RAGE through GLP-1 agonism will be of clinical benefit to patients with diabetic nephropathy.